Ancient kasbahs made of clay. Berber houses clinging to the mountainside. Homely hotels hidden in a palm grove or standing on the very edge of the Sahara. There are some truly memorable places for families to stay in MOROCCO. Best of all, though, are the riads, the archetypal Moroccan city hideaways, and you should try and spend at least a night in one whilst you’re in Marrakesh if you can. Closing the door on the hubbub of the medina and retreating into an oasis of birdsong and tinkling fountains is a quintessential Moroccan experience – although the peaceful atmosphere and (at some places) unguarded stairs can be a bit of a challenge if you’ve got energetic youngsters or toddlers in tow. The following mix of unique places to stay across Morocco – reviewed in the order you’d encounter them on our Big Trip Morocco itinerary (our favourite places to stay in Fez are listed here) – is exactly that, and staying at any (or all) of these will help your kids remember their visit to Morocco long after your trip has ended. With the exception of Douar Samra, you can reserve all of our recommended places to stay in Morocco through Booking.com; clicking on the hotels’ name below will take you directly to their booking page, where you can fill in your dates and secure your stay. To find out more about why we’ve partnered with Booking.com, see here. Spread across seven traditional houses just a five-minute walk from the Jemaa el Fna, this beautifully furnished riad is surprisingly spacious for such a superb central location. Kids will love exploring its arcades and alcoves, and playing hide and seek in its courtyards that are open to the sky and filled with citrus trees; parents will appreciate the carved wooden doors and painted ceilings throughout. RIYAD EL CADI is the one-time home of a former German ambassador to Morocco – one of his daughters still runs the place – and the Islamic artefacts that decorate its corridors were gathered during his service in various Arabic countries. Some of the riad’s 15 individually styled rooms can accommodate an extra bed, plus there’s a family-friendly two-bedroom “Blue House” that sleeps up to five. You can cool off in the small pool in spring and summer (there’s a TV room and library for the colder months), or relax at the end of a day’s sightseeing up on the large tented roof terrace. The riad’s chefs also run a recommended cooking class that includes shopping for ingredients in the medina’s markets (€50). Children under 12 stay free of charge. As the name implies, the sophisticated PALAIS LAMRANI is more of a palace than a riad. With just six rooms, a large garden filled with fruit trees, and an impressive roof terrace, your family won’t feel like you’re on top of other guests here like you can do in some Marrakeshi riads. You will, though, feel like you’re living in an Arabian fairy tale, the high-ceilinged rooms decked out in elaborate zellij tiling and stucco plasterwork and stuffed full of period furniture. The three huge suites can take an additional bed; plump for Le Harem, if you can, as it’s the biggest and most beautiful. The location is brilliant – you’re just a couple of hundred metres of so from the edge of the souks and a short walk north of the Jemaa el Fna, and yet all that feels a world away as soon as you step through the heavy oak door and into the tranquil shaded courtyard. The friendly French owners are often on hand for restaurant recommendations and the like, though the food at the riad itself is superb – few things can beat dining al fresco in the candle-lit gardens, feasting on whatever took the chef’s fancy at the market that morning. Delicious breakfasts are served up on the terrace, a great spot for catching the sunset at the other end of the day. There’s also a heated pool and traditional hammam. DOUAR SAMRA is a real labour of love. Years of careful restoration by its charming French owner, Jacqueline, have paid off, though, and this effortlessly atmospheric Berber house in the peaceful mountain village of Tamatert makes the perfect High Atlas retreat. Cosy bedrooms, many of them lit with candles, are kept warm by roaring log fires and piles of thick Berber blankets, while everyone sits down to dinner together in the colourful, cushion-strewn dining room. There are two triples in the main house, and attractive garden mini suites sleeping up to four; all accommodation is on a half- or full-board basis. The hotel organizes good-value guided treks to Aroumd and on to waterfalls or the shrine of Sidi Chamarouch (both just 75dh for kids), which include a packed lunch for full-board guests. Tamatert is the highest village in the Atlas, so the views from the roof terrace are naturally stunning – at night, the jagged silhouettes of Jebel Toubkal and the surrounding peaks are set against a star-filled sky. From the moment you’re welcomed into RIAD CARAVANE – with a mint tea and Moroccan pastries on a terrace overlooking Aït Benhaddou, whilst your bags are discreetly smuggled into your room – you know that you’re in for a special stay. Owners Andrea and Vincent have lovingly turned an old kasbah in the village of Aït Boulmane into this elegant but unassuming boutique hotel. 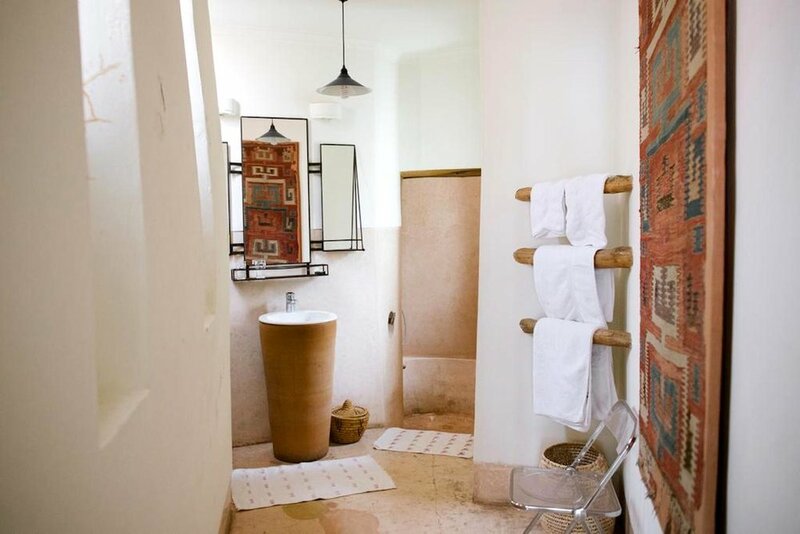 The light, airy rooms are stylish in a pared-back kind of way, with just a Berber rug or Moroccan lantern to break up the earthy tones, and have curvy bathrooms built from gorgeously smooth tadelakht. Bamako (all the rooms are named after African cities) sleeps a family of 4 in a double and two singles, three other rooms (there are only eight in total) can sleep 3 people in a double and a single each. There’s a small heated pool in the garden patio and dreamy day-beds on the terrace; Andrea and Vincent can provide a guide to help you visit the ksar, just a 10-minute walk away. Other excursions, such as guided walks or mule treks into the surrounding Ounila Valley, are also available. Nestled deep within the palm grove, LES JARDINS DE SKOURA is as tranquil a B&B as you could ever hope to find. Behind the kasbah’s sun-baked walls lies a “Secret Garden” scene of manicured lawns, gravel pathways edged with lavender, and orchards that fill the air with the sweet perfume of apricots and almond blossom. Hammocks are dotted around and awnings tied between olive trees for shade. Your kids won’t notice much of this, though, as their eyes will firmly be on the beautiful little pool at the end of the garden. Of the eight rooms, three are big enough for families: two, one of them a suite, can sleep 3 people (with an extra single bed), whilst the Suite Saguia can sleep 4. All are individually styled with regional Berber crafts – carpets, kilims, ornate mirrors and leather poufs – and have their own living rooms; the suites come with fireplaces and a terrace or patio. Delicious evening meals (half price or less for children under 11) include vegetables from the garden and home-made olive oil. There’s more to entertain your kids in the way of board games and a book exchange, free bikes and a menagerie of pets, including a cat, a dog and several donkeys – ask about riding one on a guided tour of the palmery. There are wonderful bird’s eye views of the surrounding palm trees from the kasbah’s terraces, a great place to watch the sky turn pink at the end of the day, when the gardens are lit with lanterns. One of the first kasbah conversions in Tinghir, and probably the whole of the south, HOTEL TOMBOCTOU is the former residence of the local sheikh. It was painstakingly restored using traditional methods and materials nearly 25 years ago by Roger Mimó, its affable Spanish owner, who still runs the place with an easy charm and is a font of knowledge on the surrounding area. The cool, dark rooms, named after former staging posts on the trans-Sahara trading routes, can withstand the worst the Moroccan sun can throw at them; whilst they’re fairly simply (and similarly) furnished, the decorative knick-knacks from the relevant regions – ie Glaoua carpets from Telouet in the bedroom of the same name – are a nice touch. There’s plenty of choice for families, too, as eight rooms sleep 3 people (check the arrangement first, though, as some are all singles) and three sleep 4, in a double and two singles each. You can relax after a day’s sightseeing around the child-friendly swimming pool (there’s a shallow section separated from the main pool) and enjoy your dinner in the Berber tent that’s been set up in the garden – good fun, especially if you won’t be overnighting in the Sahara. Tomboctou is removed from the transport hubbub of Tinghir’s main square but still central enough, and around 25 minutes’ drive from the Todra Gorge. Family-run KASBAH MOHAYUT must enjoy one of the most incredible settings in Morocco. Across a scree of blackened hamada, at the very end of the very long road that started 675km ago in Marrakesh, it sits at the edge of the Sahara, looking out into the rolling dunes and endless sky. Any hotel would play second fiddle to such scenery, but Mohayut competes well by combining comfortable accommodation with good old-fashioned hospitality, particularly welcome in what feels like the very far reaches of Moroccan civilisation – Moha, the ever-smiling owner, is always on hand to help, as are his friendly staff. Simple but cheerily furnished family rooms (a double and 2 singles) have their own separate seating area and spacious bathrooms with striking fossil sinks from the town of Erfoud, and either have panoramic roof terraces or are located right by the courtyard pool. All rooms can take an extra bed (free for under-5s). As well as relaxing by the pool, you can immerse yourself in your spectacular surroundings by taking a camel ride at sunset or heading deep into the dunes to experience an unforgettable night under starry skies at their wonderful desert camp. Historical KASBAH BAHA BAHA is a little gem. The former home of an Ait Atta chieftain, it is set on the outskirts of N’Kob, a hillside village on the less-travelled road that connects Marrakesh with Merzouga and the Sahara Desert – the panoramic views from its rooftop terrace, over the rest of the ksar and down onto N’Kob’s oasis, are superb. There’s a large, immaculate garden and a small pool flanked by black Berber tents – similar to the ones you might see scattered across the foothills of the nearby Jebel Saghro – that provide shade during the heat of the day. The good-value rooms are split between the kasbah itself and the garden and are nicely fitted out (all the furniture, including the beds, is made from palm leaves, for example, and the carpets are woven at the adjoining weavers’ workshop, part of the kasbah’s own museum); all of them can sleep at least 3 people, with the largest ones, the so-called Authentic Rooms, sleeping 4 with an extra bed – though these share a bathroom. The attentive staff can organize tours of the palm grove or hikes into the nearby Saghro mountains. Clinging to a hillside above the Berber village of Tisselday, the smashing little guesthouse of IROCHA is a great place to break your journey back to Marrakesh. Catherine, the French owner, and her Moroccan husband Ahmed have got Moroccan chic down to a fine art, decorating the public spaces and bedrooms with local furnishings like inlaid chests and pom-pom Berber bedspreads. The roomy split-level family apartment is made up of a double bedroom, two single mattresses on a mezzanine level above a lounge (complete with piano), and a tadelakht bathroom; two of the suites can take an extra bed to sleep 3. The slim pool is heated most of the year, and there are also board games and puzzles, plus a traditional hammam. Irocha’s dining room is a convivial spot to enjoy a final tagine before your flight home, and the terrace a pleasant place for breakfast the next day (not included in the price), looking out across the hills and over the N9 as it winds its way up to the Tizi n’Tichka pass. Note that they don’t accept credit cards and the nearest ATM is in Ouarzazate, 50km away.